As the election tensions mount, it’s time for a feel-good moment. Such is available at the Candlelight Pavilion Dinner Theater in Claremont, with their sparkling production of “Sister Act – The Musical”. Tuneful and fast-paced, it offers up a lot of heart, some terrific performances, and an elemental joy which provide just the antidote to the divisiveness of our time. Born at the Pasadena Playhouse, this Broadway musical riffs off of the 1992 movie of the same name, and – like the movie – depends largely on the central character to make the entire concept work. In the Candlelight production, this is not a problem. Indeed, with only minor exceptions, the entire cast proves particularly strong, allowing all the charm of the piece to shine through. The story centers on Deloris Van Cartier, an aspiring singer and girlfriend of a married gangster. When she happens upon her boyfriend and his henchmen murdering a suspected stool pigeon, she runs to the nearest police station. There Eddie, a high school acquaintance who is now a cop, arranges for her to hide in a nearby convent. After considerable resistance to convent life, Deloris begins working with the terrible convent choir, improving their “act” so much that the once nearly empty church becomes so popular it attracts attention from the Pope himself. And, of course, thereby hangs a problem: publicity for someone who is supposed to be hiding. Daebreon Poiema proves a huge ball of energy as Deloris, singing and dancing up a storm and setting the pace and tone for the entire production. As her main foil, the traditionalist Mother Superior of the order where Deloris hides, Debbie Prutsman finds the balance between severity and care the character needs, sings her wistful, important songs with conviction and style, and makes the counterbalance between these two strong characters work. Also worthy of note are Pete Cole, quite intimidating as Deloris’ murderous boyfriend, Michaelia Leigh as Sister Mary Robert, the shy postulant who comes bursting out of her shell, and Sister Brittany Tangermann as the enthusiastic and friendly Sister Mary Patrick. Indeed, all the supporting cast of nuns create a solidly entertaining ensemble as they jazz up mass. As the henchmen looking for Deloris, Robert Hoyt, Christopher Mosley, and Marcos Alexander have several moments of comic silliness. As Eddie, the cop whose earnest concern for Deloris begins to rub off on her, Fabio Antonio dances well and gives his character the mild nerdiness which contrasts well with Deloris’ view of “cool”, though he needs to work on his vocals. Jamie Snyder gives the Monsignor threatening to close the nuns’ home church a gentleness which makes him more empathetic than sometimes. Director/choreographer John Vaughan keeps the pacing clean, and provides just the right kind of dance moves to contrast the two parts of Deloris’ life – what works in full habit, and what works on the nightclub stage. As a result of his cohesive vision, the show has a strong feeling of polish from start to finish. “Sister Act” may not be the deepest show one could see, but it has a message of hope and understanding which seems much needed in the current public atmosphere. At Candlelight – the last real dinner theater in the Los Angeles area, and a very going concern – one also gets a good meal, in a relaxing atmosphere. And with a production as good as this one, this all becomes a great retreat, and a fine entrance into the mellow nature of fall. 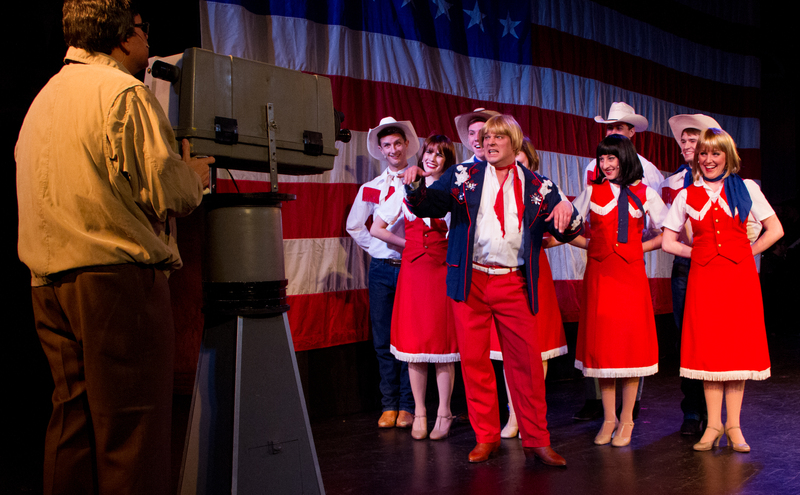 It’s not the first place you think of to host the silly, but somewhat risque 1970s musical “The Best Little Whorehouse in Texas,” but the Candlelight Pavilion Dinner Theatre in Claremont has made reputation recently for redefining the material such an institution will provide. Hot on the heels of “The Full Monty” and “Sweeney Todd,” their stage now hosts a ladies of a house of ill repute, a chorus of randy football players, and a live country band. Actually, that batch of live musicians is the most innovative choice. With the exception of concert-like or tribute programs, Candlelight Pavilion usually uses the pre-recorded material now available for musicals on small stages. The in-house band, headed by musical director Douglas Austin, gives an immediacy to everything which proves surprisingly satisfying. The production itself, directed and choreographed by John Vaughan, has style and pizzazz, and just enough titillation to bring that “wink, wink, nudge, nudge” factor one expects from a musical about such a topic. The performers are earnest to excellent. Still, one of the things which jumps out at the audience the most is how far we have come in our sensibilities since the 1970s. The thing isn’t played like a period piece, but it is one. Lisa Layne does a solid job with the practical, but caring madam, Miss Mona. She has the voice for country music, and her performance does much to hold the show together. Steven Biggs’ friendly country sheriff makes a nice balance to Layne, offering tinges of middle-aged romance in the midst of the rest. Rashonda Johnson delivers another show-stopping performance as the house’s maid. Indeed, all of the cast are enthusiastic and the energy is consistently strong. The singer/dancers who form the ensemble of “girls” and their paying customers dance well. The only slight disappointment comes from the comparatively quiet rendition of “The Aggie Song” – normally one of the most testosterone-laden shout-outs in modern musicals. Jeremy Magouirk makes fun work of the righteous investigator who threatens the house’s existence, and David Aldrete has fun with a stereotypical Texas politician or two. Still, despite a script offers a view of women, and of prostitution, which is increasingly old fashioned. When the sheriff argues the economic plus to having this industry near town, it just isn’t as funny as it was when I first saw it in 1979, and not because it isn’t well presented. So, the Candlelight Pavilion production of “The Best Little Whorehouse in Texas” is not for children. It’ just graphic enough – at least in implication – to leave younger kids with some awkward questions at the table. It is, however, quite well done, filled with entertaining dance numbers and considerable humor. Placed in its own time period, it becomes a humorous counter-argument to the women’s movement. Placed in our own, it jars a bit with how far many feel we’ve come in the past 35-40 years. The American musical has evolved over time. No long do you find, except as a send-up of a former age, the kind of fluffy shows common in the 20s and 30s, when George Gershwin, Irving Berlin and Cole Porter created so much of the Great American Songbook. Attempts to look back at that era often become self-conscious or satiric. It’s nice when someone just returns for a loving look. This is the case at the Candlelight Pavilion, where Porter’s classic “Anything Goes” gets a charming rendition, played in time period – for laughs, rather than to be laughed at. The singing is good. The dancing is appropriate. The characters, though broadly drawn, are tuned just right. The net result is a lighthearted, nostalgic evening of sheer entertainment. The story is one typical of the era. Mistaken identity and sensual attraction rule the day. A wealthy and rather lascivious banker crosses the Atlantic on a great liner, along with a famed evangelist turned nightclub singer and her chorines, a minor gangster pretending to be a missionary, his moll, and a young American with her British fiancé, her mother, and the old beau who stowed away to break them up. Various parings and re-pairings ensue. Stacy Huntington makes energetic and believable work of Reno Sweeney, the songstress, giving those classic songs a fresh spin. The other standouts include R.C. Sands, genuinely funny as the marginally famous gangster, and Nick Tubbs, who makes the Brit truly likable, rather than just silly-pompous. For once you can actually understand why Reno falls for him in the end. Also good is Chelsea Baldree as the gangster’s gal with a heart of gold, and James McGrath, who gets to sing a lot of the best duets as the stowaway young stock broker. Rachel Davis makes a lovely ingenue, and sings most sweetly. John Lynd gives the banker the necessary combination of myopia and lustful thinking. Toni Lynd makes the intrusive mother a cross between a pushy stage mother and an upper crust church lady. The chorus sings and dances, tap included, with great style (and perhaps a little recorded enhancement), giving energy to the “Heaven Hop” and “Blow, Gabriel, Blow” – the show’s two showstoppers. John Vaughan, as always has done a lot with a small space, giving the impression of large chorus numbers with a minimal cast. Timing is key here, as the script borders on farce, and Vaughan keeps things sharp, allowing the piece to flow quickly and charmingly across the evening. The set, a standard one, is used well, and most of the costumes fit well both the people in them and the time period. In short, this “Anything Goes” honors well that vibrant and silly genre so surprisingly well suited to Candlelight Pavilion’s intimate setting. The meal is pretty good too, right down the intermission desserts. In this time of political and social jangling, sometimes it’s nice to look back to when “entertainment” meant parking your brain for an hour or two, and humming along to great tunes.